We were excited to hear that our Carina is getting the same Pre K teacher that our son, Sal, had at Christian Preschool of Thousand Oaks! Mrs Curtis has a son who plays in the same Flag Football league and seeing her over the years has been a blast! She has seen me through 2 Pregnancies, a major car accident where two of my girls and I were TBoned. We just love Mrs. Curtis and our preschool! Carina wanted to make a present and this is the fun lil gift that we made for her. 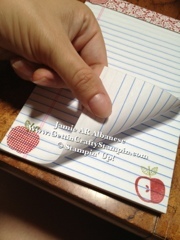 It was fun and easy to do with my quality time and my Preschooler! 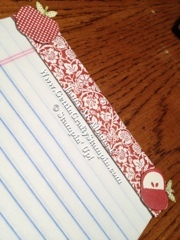 We decorated this pad of paper with the DSP from Twitterpated in Riding hood red color scheme. 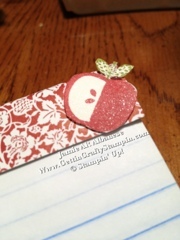 I stamped our two apples from the Perfectly Preserved stamp set on Shimmer Paper in Riding Hood Red ink and stems in Old Olive. 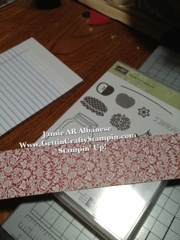 With our snips I cut out the apples and then restamped the apples alternating design per page. I Hot Glued this DSP on the top of the pad. 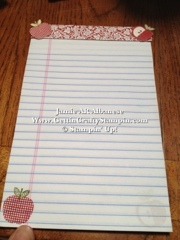 I used the hot glue to adhere the subtle sparkled apples to the top of the pad. 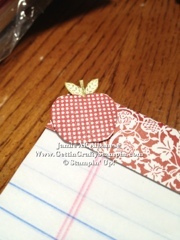 Iiii love this sweet lil pad and can't wait for the intro class tomorrow morning! 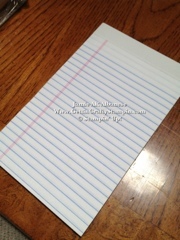 One thing teachers sooo send home are notes! I hope this is just her style! Whoo Hoo! Mrs Curtis and preschool!